Many people I know fell in love with Thailand after watching Thai movies or TV series. Their romantic plots, relaxed lifestyle, and beautiful scenery made Thailand a premier destination for vacation or even starting a new life. After living in Bangkok for a long time, I find the beautiful scenes in movies really exist in every corner cafe, each cozy roadside market as well as all the fancy restaurants. I’m single, but I often picture myself with my loved one enjoy a warm afternoon in one such place. In this guide, I've covered a few good spots that are perfect for a date in Bangkok, hope you have good memories here regardless if you just started dating someone or you are already in a relationship. Afternoon tea is one of those must-dos for a memorable date. While enjoying tasty coffee and desserts, you can share interesting stories with each other, capture the best moments with photos, and of course if you are a good photographer, even better, brownie points for you! Here are some cool afternoon tea places of different styles for you, check them out. This first one will for sure get you brownie points on your date. The minute you step into Pool Time Cafe, you can't help but wanting to change into a swimsuit for a pool party. It is decorated like a small shop alongside a beach; a breeze of coolness in the hot sun. Inside the Pool Time Cafe you can also find many decorations related to swimming pools, all are great for taking photos with. I suggest wearing light colors if you visit this cafe, such as light navy and candy colors, they work perfectly with the overall theme of the shop. There are also some interesting souvenirs for sale in the shop. This seat next to the window is perfect for a good photo, regardless the shooting angle or lighting condition. This corner near the window is also a great spot for taking photos, using its macaron-color wall and cute staircase. In front of such a pretty background, any subject would look amazing, regardless if it’s a portrait photo or photo about food. Bring your date here to the Pool Time Cafe, I think you both will have a memorable time. About the food at Pool Time Cafe. There is a house-special drink here, to me it actually tastes a bit like fruit bubble gum, topped with cereal rings and milkshake, the taste is superb! Almost everyone buys one in the shop. By the way, if you like desserts, you should definitely try the caramel-banana pancake with coconut ice-cream, it's amazing! Wait, do you think that was everything? There’s a surprise on the second floor. Actually, Pool Time Cafe is also nicknamed Raccoon Cafe because you can play with cute raccoons upstairs. There are three raccoons, they would beg for food, they might even search in your pockets. It is said that one of the raccoons is named Japan, he can be pretty moody, sometimes he doesn’t even want to be caressed by the store owner. Staff in this raccoon coffee shop will teach you how to take photos with these cute raccoons, even a “family photo” with you and your date. Suggest to take BTS and get off at Ekkamai station, then take a taxi or walk for about 15 min. You can always find romantic and artsy places in Bangkok like Organika House, this coffee shop even has a spa. Organika House is said to be owned by Siririta Jenson, a Thai actress. Siririta Jenson is a perfume and spa lover, so she opened this shop to help people relieve stress and be closer to nature. Organika House occupies two floors in a building, the fifth floor is the spa and the sixth floor is the cafe. The entire shop uses a lot of plants, making it an indoor garden. The bar counter is built like a birdcage with all kinds of fruits and perfume products on it. Sitting in it feels quite relaxed and comfortable. There’s no bad photography angle here. Good photos, good mood, good date. Besides coffee, there are also some cool little perfume products. Organika House combines essential oil and food together, the end result is quite a pleasant surprise. After being toasted, the citrus slices get a pleasant fragrance of wood. It's wonderful to make tea with them. Citrus peels soaked into Bourbon Whiskey, with a few drops of citrus essential oil, the refreshing taste dances on your tongue. In the cup with dry ice and passion fruit, there’s rose and rosemary essential oil too, with a bit of water the misty fragrance comes out, what a spa-like food experience! After enjoying your drinks, you can relax yourself in the spa downstairs. How is this date for a couple, pretty cool isn’t it? You can also buy skin care products and essential oils in the shop, they all seem quite good. Boyy & Son Cafe is a chic coffee shop located inside Gaysorn Tower. With its unique decoration and high-quality drinks, it has become a popular destination among coffee lovers. Boyy is a luxury handbag brand founded by Canadian designer Jesse Dorsey and Thai designer Wannasiri Kongman. Boyy & Son Cafe is right beside the handbag store. Bags of Boyy are simple and elegant but without any logo on them. The same style also goes for their coffee shop. The walls painted in Tiffany blue give people a refreshing feeling. The granite tables and seats may give a cold and rigid impression but the small plants and soft curtains make everything feel elegant and harmonious again. The flowerpots are in the same color as the walls, and the plants are short green-leaf plants or succulent plants, leaving people with an impression of tidiness. There is a wall-mounted fish tank, looks like a small aquarium. Sit next to the window, have a chat with friends over coffee. Not only does Boyy & Son Cafe have delicate decoration, it also has delicious food. I highly recommend their orange mocha! I’m obsessed with citrus flavored coffees, such as this cup of mocha, it gives layered flavors. You can taste fresh citrus besides the strong coffee aroma. Moreover, the rosemary topping also boost the taste to another level. The fresh-baked sweet cookies are also soft and aromatic. And its plate is really a perfect match with the coffee cup, they look like the sun and the moon. If you are a chocolate lover, then you can’t miss Boyy & Son’s mint flavored hot chocolate. I can’t believe I almost drank half a cup without a taking a breath, it was sweet but not too sweet. Mint is such a great match with chocolate. By the way, don’t you think its color goes really well with the granite color theme of the shop? This Japanese style coffee shop is perhaps an excellent place to treat obsessive-compulsive disorder. Decorated in a plain and minimalist style, Pressed Cafe is simple and elegant. The gray walls and floor reflect a silver light under the sunshine. Its tidy display gives a pleasant feel. Wearing a white shirt or t-shirt would turn out really well in photos. All of Pressed Cafe’s decor presents a feeling of delicacy and coziness. What's more, the staff here are very welcoming! The drinks here at Pressed Cafe are well presented, their packaging is quite interesting too. Besides coffee, they also have juices made from organic vegetables and fruits, give them a try. Sunlight is cut into strips by the blinds. Time seems to stop. It makes me want to just sit by the window and think about nothing. Pressed Cafe’s specialty drinks are quite unique. Taking “Summer Garden” as an example, it is specifically prepared for the summer. It is made by orange soda water, together with soft-seeded pomegranate and rosemary topping. More interestingly, there is a bottle of “essence” beside it. Interestingly, it’s actually a bottle of syrup. You can add it to your drink according to your personal preference. The sweet and sour taste cools you down in the hot summer. This one is called “DIY Chocolate”, you are given a glass of milk and a tube of “hand lotion”. The “hand lotion” is actually chocolate cream. You add it to the milk according to your own taste. It's really a great concept to mix milk with chocolate. Great ambiance, interesting DIY concepts, you gotta give Pressed Cafe a try. Eden’s Cafe is like an artistic gallery with plaster sculptures and candles displayed beside the cafe window. It looks like a mansion but the owner had gone for an adventure. Oil paintings on the walls, flowers and cakes on the long dining table, all look golden under the warm light. Although Eden’s Cafe is not very big, it has quite a character. Every corner is Instagrammable. We can tell that the owner spent a lot of time on the details. The collections here are also very interesting, they look like old antiques. If you are good at drawing, draw a sketch of your date, it’d be so romantic and artsy. Even the menu at Eden’s Cafe is very cute with special hand drawings. Of course, their cakes are also very delicious! Going further in, there’s a staircase leading up to the second floor. The staircase, by the window, in front of the mirror, everywhere on the second floor is a good spot for photographs. This small but cozy coffee shop will certainly earn you some praise from your date. After getting off at the Ratchathewi light rail station, you will see this vintage looking two-storey building, that is B-Story Cafe. The house has lots of windows and it is decorated with many flowers. With all the natural light and plants around you, you'll feel so relaxed it makes you want to stay here for an entire afternoon. The cakes at B-Story Cafe look very tempting and appetizing. There is a small balcony on the way to the second floor where there are many interesting items of vintage style on display, such as dried flowers, green plants as well as small jars and porcelains. By the way, they are all for sale. With glass roof and floor-to-ceiling windows, the patio is very chic. Besides, there are lovely tables, chairs, pillows, as well as carefully crafted decorations. This leads to the second floor of B-Story Cafe, upstairs feels like an attic in a castle. Couples are everywhere around you even these dolls seem like they are in love. You would be wrong if you assume that the owner of B-Story Cafe spent so much time on the decoration, then their food probably wouldn’t taste special. Their Thai food, western bakery, every item tastes high quality. Their latte art is quite pretty too, their cakes are yummy and not too sweet. In an old train cabin, there hides a store selling vintage accessories and a coffee shop. Un Fashion Cafe has all kinds of stuff: key chains, leather shoes, vintage clothes and purses and so on. They have different color options too, make matching to different style of outfit easy. More importantly, the prices are very decent. Next to the store is the coffee shop. The shop’s ambiance seen through the window alone would make passersby turn their head. Inside the Un Fashion Cafe, the interior decor feels very cozy and welcoming. The cafe isn’t too big, ideal for a more quiet chat, the whole setting feels like an art film. Delicious desserts are displayed beside the floor-to-ceiling windows. Freshly baked cakes and fruit tarts give out a pleasant aroma. Uu Fashion Cafe is designed like a train cabin. Both windows and seats are designed like those in a classic train. Customers would feel like they are onboard a train; and for me it made me recall the excitement I had during my first train experience. The comfortable window seats seem to have the ability to make time slow down, I want to just sit here with a cup of coffee and relax. It’s a great spot for a couple photo. Un Fashion Cafe’s second floor is also wonderful, they even installed baggage racks to look even more like a train cabin. Delicately crafted desserts and coffee give the cafe an even better image. The richness of their cheese cake, combined with a cup of rose latte, not only pleases visually, it also fulfills anyone’s desire for a good taste. When rays of sunlight shine through the windows, time seems to condense at that moment. Un Fashion Cafe will definitely leave an unforgettable memory for you and your date. It is quite common in Thai movies and TV shows that the main characters, typically young couples, enjoy nice food in roadside restaurants, at night markets or on busy streets. If your date is a foodie, why not bring her to have some delicious local food? There are so many choices of food in Bangkok, if you ask for something tasty and fun, you have to try this all-you-can-eat shrimps place. Taikong Seafood, a seafood buffet, has become very popular lately. Now the restaurant has another location in Talad Neo night market, not far from Central World. There is this famous Hainan Chicken Rice across the street from it too. Taikong Seafood is located next to many handcraft shops and snack stands. There are live shows as well. Take a look at the fresh seafood they got: sea snails, crabs, clams, mussels, razor clams, all unlimited supply and they are super fresh too! Vegetables and other snacks are all very fresh too. But the most well-known specialty in Taikong Seafood is their live prawns! Catch a few prawns from the fishing tank of bubbly water, grill them at your dinner table, it cannot get more fresh than this! Look! The prawns are all live and kicking, you might get spattered by with water though, as you lift the prawns from the water tank. The process is so much fun, it’s a great activity on a date. Whether it’s a date or a family gathering, it will be memorable experience! As the fresh seafood gets cooked over the grill, shells start to turn orange, you can smell the aroma coming out of them. Crabs smell awesome. sea snails taste delicious, but my favorite at Taikong Seafood is still grilled prawns. They taste so fresh, with a bit of natural sweetness, no sauce is needed. Pe Aor, located in an alley near the light rail station Rathathewi, is well known in Bangkok for its tom yum soup noodles. Not only has Pe Aor been featured on TV, it is frequented by many celebrities as well. Pe Aor is not a big restaurant but it feels very cozy. It reminds me of the old-style restaurants in my childhood with the wood tables and posters on the wall. Besides, the restaurant owner is an avid collector who has collected many anime toys and models. The most famous dish in Pe Aor is their lobster seafood tom yum soup noodles. The restaurant owner reminded me gently that I might be unable to finish it by myself since the table next me shared it with four people. But I looked at him and answered firmly, “I will finish it”. When the noodle came, I was surprised how big the bowl was. The bowl looked like a huge pot. It might look small in photos, but you know what, one single mussel was the size of an iPhone. Look it for yourself. I think by now, your date should be pleasantly surprised, and praise you for your choice of restaurant. A couple sharing a large bowl of soup noodles, just like a scene in a Thai movie. How romantic! There are 6 different types of “noodles” to choose from, it can be rice noodles or vermicelli or else. The seafood includes a big lobster, mussels, crabs, squid, salmon and my favorite soft-boiled egg. All of the seafood are very fresh, the soup base is rich and aromatic too. This only costs 999 THB. But the price would be a bit higher if the lobster was bigger. Nevertheless, it is highly recommended! Regular tom yum soup noodles here at Pe Aor only cost 60 to 150 THB, and they also taste very good. Some of the best food every city offers is often found at street food stands. If you work late into the night or you and your loved one feels hungry after a long walk, there’s always that one shop still open to serve customers. On the busy Thaniya Road, there is a vendor of Japanese soba noodles. Since many Japanese travellers like to visit this neighborhood, it’s not hard to find Japanese restaurants here. Located at the end of the street, Torisoba Nanase seems to be quite an ordinary shop. Nanase only has 8 seats. Four seats at the bar table, and four seats by the shop in the open space. Looking from this angle, it feels like a framed painting, telling its version of all the stories happened here. You know, many love stories started from an encounter at a food stall. Nanase offers a dozen different kinds of soba noodles, such as Japanese style and There are over ten kinds of soba noodles here with traditional Japanese and Thai fusion style. You can also request extra ingredients, such as eggs and fish balls. After ordering your soba noodles, you can sit and watch the chef cook in front of you. The staff are pretty quick, and they are very nice. They use homemade chicken soup as the soup base. I remember when I was a kid, whenever I had a fever, my mom cooked chicken in a clay pot, then use the soup to cook noodle for me. It was such a good memory. Nanase’s soba noodles are cooked just right, not too soft and not too hard. With a bit of diced green onions, it tastes so good! For me, I'd like to add wasabi to soba noodles. Wasabi’s unique smell mixed with soba noddles, it makes the soup taste even better! Such a bowl of delicious saba noodles would wash away any bad mood, it’d all be replaced with happiness. Have you ever eaten something so delicious that you just couldn’t forget, you even dream of it when you sleep? The crispy pork at Guay Jub Mr. Joe is one of those restaurants, at least for me. Hope after you bring your date to Guay Jub Mr. Joe, he/she would also dream about coming to this restaurant again with you. The place is already busy even before lunch time. Neighbors and office workers nearby like to dine at Guay Jub Mr. Joe. Why? Because it is inexpensive and tasty! Although it is a restaurant recommended on the world famous Michelin Guide, their prices are surprisingly affordable. Bowls filled with spices and sauces are laid out on the table, as boiling soup is poured into each bowl, aromatic steam fills the room, I couldn’t help but take a few more breaths. Outside the restaurant, lots of office workers are lining up for take-outs; inside the restaurant, some senior citizens casually read newspapers, some brought their kids over to enjoy the food. It’s such a lively scene, I just love it. Here comes the main dish, the aromatic smell really makes me drool. The three layers of pork in each piece are clearly seen; the outer layer is the golden fried pork skin, the middle is a thin layer of fat, then the last layer is the lean pork meat. The skin is crispy, the fat is not greasy, the lean meat is tender and juicy, everything already tastes so good even without any sauce. Just one bite can make me feel like heaven on earth. Another specialty here at Guay Jub Mr. Joe is their pork entrails noodles. The soup base is boiled with pork bones and peppers, the ingredients for the noodle soup include tripe, skin, etc. It’s one of the best noodle soups I’ve had, the entrals don’t taste gamey at all. The rice noodles are also cooked just right. Give it a try! It seems that among the popular places to have a date, night markets are often one of them. Colorful lights, bustling crowd, laughters from shoppers, shouts from street vendors, delicious smell blended into the air, night markets always have this special charm. Among all the night markets here in Bangkok, I like Train Night Market Ratchada the best. At Train Market, you can find all kinds of local specialties or snacks popular on Instagram, like five-color mango rice, rainbow toast, the list goes on. This is a great opportunity to take photos with your date, and share some nice food together. You can find specialties like creamy pickled crabs, sizzling seafood BBQ, freshly cut coconuts. They will sure satisfy your foodie craving. There’s also this popular vendor that sells fried vegetables at Train Market. This beautiful server is probably one of the reason why the shop is so popular. They sell many different kinds of fried vegetables, like mushrooms and green leaf vegetables, not only they look lovely they taste so good too! BBQ octopus is another must-try at Train Market. One bite and the sense of satisfaction can only be understood once you have tried it. BBQ skewers (or kebabs) are also my favorite, inexpensive and delicious! I ate so much as I toured the night market, by now my stomach already became a warehouse. Banana crepe, fried quail eggs, sushi, seafood rice bucket, I ate so much, the delicious foods were challenging my senses. You can tell how awesome Train Market is just by looking at all the happy faces. After you are done eating, there’s another thing you should check out with your date. Through the staircase in the parking lot beside the night market, you can climb to the top and enjoy a bird’s eye view of the entire Train Market Ratchada. It’s for sure going to be an unforgettable memory for you and your date. 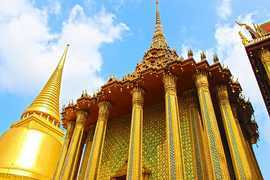 Sometimes you need a bit of ceremonial sense in life, and Bangkok is probably one of the best places to experience high end romance. From private kitchens to top ranked restaurants in Asia, you can get high quality services at affordable prices, perfect for a date that needs a bit of “haute gastronomie”. In this alleyway, there is a glass house where only ten people can be accommodated at a time. Its ambiance is so beautiful at sunset when rays of sunlight shine through the glass. Flat Marble is a steakhouse, its design cleverly incorporates the tree that was originally on the same land into the restaurant’s interior. The whole setting makes customers feel closer to nature. There are only ten seats in total, they are aligned side by side by the kitchen, look quite cozy. Flat Marble’s interior decoration and tableware are also very exquisite. Though the space isn’t big, the quiet atmosphere makes you feel like you are dining in a forest. Staff will ask you to select a steak, the prices depend on the origin of the beef. Many of their steaks are imported from Japan and Australia, all are of high quality. Next, you can watch the whole process of how your steak is cooked. Order some wine, have a chat while waiting for your steak, isn’t this relaxing? When it’s ready, they’ll bring your succulent steak, it will have such a good aroma. I personally prefer well-done steaks, with a bit of Flat Marble’s mushroom sauce, the steak is still very tender and tasty. The fat portion of your steak won't be wasted, the chef at Flat Marble will use it to make you a bowl of fried rice, with some garlic sauce, so yummy! How about having some desserts after your meal? You can try this tofu-like pudding, it has a rich milky taste, sweet but not too sweet. Topped with some popping candy, it brings back so much childhood memory! The black truffles here are also quite popular. The overall experience at Flat Marble is awesome, I’m sure if you and your date came here for dinner, you’d have a very memorable one. Nahm, a Michelin one-star restaurant, has won many titles and has a great reputation among Thai restaurants. In 2014, it was awarded the best restaurant in Asia and since then it has been featured in numerous rankings every year. In 2018, it again won 10th place among the top 50 restaurants in Asia. Speaking of Nahm, we have to talk about its founder David Thompson first. Back in the 1980s, David travelled from Australia to Thailand, and during that trip, he acquainted a Thai friend. When he visited the home of this friend, the grandmother cooked him traditional Thai food, and that opened up his culinary journey in Thai cuisine. Later on, he started to learn cooking in Thailand. Then a few years later, he opened a Thai restaurant in Australia, and soon after, it became a huge success. He was then invited to London to open Nahm in The Halkin hotel, which became the first Michelin-rated Thai restaurant in the world only after 6 months since its opening. In 2010, David opened a new location in Bangkok, and was listed as Asia’s 3rd best restaurant, and this is the restaurant we are talking about here. Nahm is located in the Metropolitan Hotel, and it’s next to the outdoor swimming pool. With the white walls and blue water, it has its own unique charm. The seats next to the swimming pool are the best seats on a date. Nahm’s decoration is inspired by Thai traditions, its dark red columns and wood tables present a formal and classy atmosphere. There’s a requirement on dress code, things like flip flops and sleeveless shirts are not allowed. No need to dress super formal, a “smart casual” outfit is sufficient. Nahm’s menu is divided into appetizers, salads, curry, soups, main dishes, and desserts. You can order anything like, but the best deals are probably their set menu. Lunch set menu costs about 1600 THB, dinner set menu costs about 2800 THB, both cost less compared to if you were to order the same items individually. This is a complimentary appetizer. Topped with a ball made of nuts, tamarind seeds and palm syrup, together with a fresh pineapple slice, its sweet and sour taste is quite appetizing. This is also an appetizer. It’s made of rice flour stuffed with dried shrimps, pork, peanuts and spices, then fried into a golden color. It is a traditional Thai snack, you can even find it on the streets, I can eat a whole box of them. A mix of chicken, green mango, salak (snake fruit) and spices on a Thong-land leaf, it has a refreshing taste. This salad, made of fiddlehead ferns, is commonly seen in Northern Thailand. With wild prawns and tawai sauce, it is really authentic northern flavor. This tom yum soup is a clear soup without coconut milk, it tastes pretty good with its sour and spicy touch. But it may be a bit salty for some people, so consider eating it with some rice. This vegetarian turmeric curry tastes relatively light, there’s quite a bit of coconut juice in it, together with squash, eggplant, baby corns, and grape tomatoes, it goes really well with some rice. This steamed grouper is perhaps my favorite dish of this dinner. The fish is so tender and juicy, you can really taste the freshness of the fish, it just melts in your mouth. The fried garlic and soybeans topping makes the everything tastes even better. This tropical fruit slush together with Thai-style coconut crepe wash away any oily flavor from earlier. Overall, you get the value for your money at Nahm. Great atmosphere, excellent service, innovative menu items, all make the restaurant stand out. I find Nahm a great choice for a date. Gaggan, ranked the top restaurant in Asia, is really hard to book a table, no one answered my phone call and my email inquiry wasn’t responded to either. So instead, let me introduce you Gaa, a sister restaurant of Gaggan. Indian chef Garima Arora runs Gaa Restaurant, she used to work at Noma in Copenhagen and later came to Bangkok to join the Gaggan team. This restaurant is located across the street from Gaggan, and is rated a one-star Michelin restaurant. The interior style of Gaa is quite special, it gives an exotic touch to the atmosphere. Every evening two tasting menus are offered at Gaa. One is 10 courses for 2,400 THB, and the other is 14 courses for 2,900 THB. Extra charge for wine or other drinks. This complimentary bean snack actually tastes really good; fresh beans topped with a fried quail egg then placed on a thin tart, the appearance alone is such a nice surprise. I was served a glass of apple juice mixed with basil juice before the meal, its sweet and sour taste is quite appetizing. The mix of two juices produces a new flavor that I hadn’t had before, very delicious. The base of this chilled soup is made of squash and passion fruit, then added green mango, passion fruit pulps and pickled cucumber cubes, very refreshing. This seemingly small ball actually has a lot of filling in it: tender duck meat plus sweet cheese then mixed with spicy curry sauce, it has a such layered taste to it. Chicken liver is first made into mousse-like paste, then after being frozen, it is cut into slices and put on thin crepes, it’s designed to be eaten before it’s melt. The creamy taste of chicken liver is really satisfying, together with the scent of rice, what a great taste! Corn is one of my favorite food. Here at Gaa they grill baby corns still wrapped in leafs, then once cooked, you dip a corn into the butter sauce and eat. To be honest, I can eat two dozen of these easily. Fresh coconut juice can really wash away any oily taste in your mouth, together with jasmine, they have such an interesting flavor, I really recommend you try it. Underneath the fried mustard leafs, you find the silky smooth tofu. Tofu is slightly sweet on its own, mixed with the unique smell of mustard, they produce a special taste. This is another surprise for me, a crayfish tail is covered with curry sauce, placed onto a thin crispy crepe, then topped with grapefruit. Can you imagine the rich flavors? It was so good. One piece was just not enough for me. It’s not just a regular cauliflower. It is grilled and dipped into their special cheese sauce. The sauce is so delicious, I wish I had some bread to go with it. Before the main dish, I was served with this spicy drink. The juice first tastes light and fresh, then the after-taste is a bit spicy, I feel like it can help with digestion. I was totally won over when this dish was brought to me, it looked so pretty! On the grilled pork rib, there are three toppings of different colors: pomegranate, diced onions, coriander stems. Marinated with fermented miso salt, the pork rib tastes soft and tender, and together with the three toppings, it was just perfect! A small round bread came with the pork rib, it has a curry onion flavor to it. Its presentation was quite cute. This ice cream with mango and nuts topping is made of egg fruit from India. The egg fruit tastes like avocado, slightly sweet and fragrant. When I ate the Indian-style Danish roll, I wondered if it was a tribute from the chef as her experience in Denmark paved the way to her success of today. This Danish roll is very soft with a strong aroma of Indian spices. What a perfect ending! Next time when you visit Bangkok with your loved one, remember to find a good place and have a date. If you are single, don’t worry, actually regardless if you are travelling solo, two people, or with a group of friends, always take care of yourself and eat well! Posted on Feb 24 2019 at 01:55AM UTC. Posted on Jan 31 2019 at 12:10AM UTC. This is the most in-depth article I have ever seen and I've lived in Thailand myself. Posted on Jan 21 2019 at 07:30PM UTC. These are some AMAZING places. How do you find these gems? Posted on Jan 21 2019 at 03:12AM UTC.